Transit Utilization and Traffic Congestion: Is There a Connection? This entry was posted in Uncategorized and tagged Autonomous Vehicles, Bias, BRT, Bus, Chapel Hill, Charlotte, Commute, Congestion, Density, DOLRT, Durham, Grand Jury, LRT, Lynx, Myth, Orange, reports, resources, Taxes, Traffic on August 28, 2015 by admin. 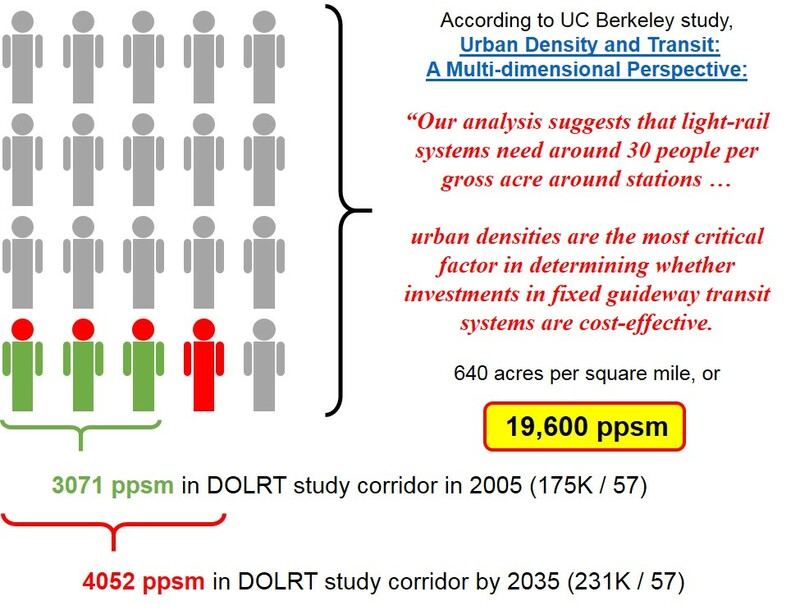 What really matters to transit-oriented development [TOD] outcomes? According to the report, the #1 predictor is strong government support for redevelopment, while the #2 predictor is real estate market conditions. The #3 predictor is the usefulness of the transit services — frequency, speed, and reliability as ensured by an exclusive right of way. Using rail vs bus technologies does not appear to matter much at all. — yes, great bus service can stimulate development! There seems to be a continued LRT bias where advocates claim that LRT is the only way to support population growth using TOD (Transit Orient Developments) and that TOD has an inherent affinity for LRT over BRT. However, studies from the US GAO (BUS RAPID TRANSIT, Projects Improve Transit Service and Can Contribute to Economic Development) and a recent study of 21 North American transit corridors across 13 cities by the Institute for Transportation and Development Policy suggests otherwise. The study concluded that strong government support for redevelopment and real estate market conditions were the primary drivers that drove successful TOD. 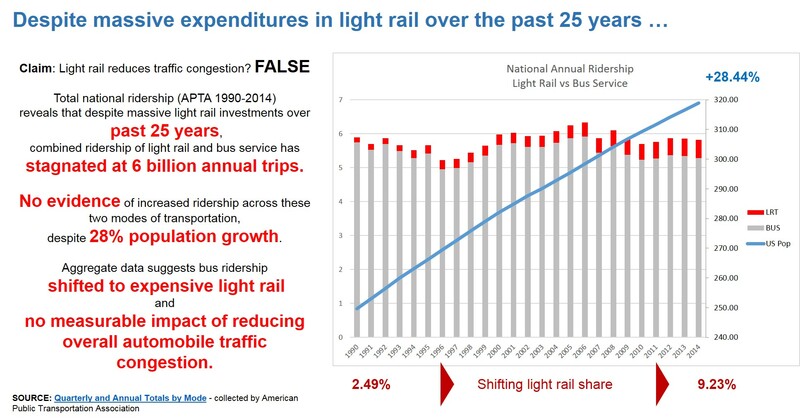 The use of transit technologies (rail vs bus) did not matter at all. Outside of the US, in cities like Curitiba, Brazil, and Guangzhou, China, there is copious evidence that BRT systems have successfully stimulated development. Curitiba’s early silver-standard BRT corridors, completed in the 1970s, were developed together with a master plan that concentrated development along them. The population growth along the corridor rate was 98% between 1980 and 1985, compared to an average citywide population growth rate of only 9.5%. This entry was posted in myth and tagged 2040, Acre, Capacity, Charlotte, Commute, Congestion, Density, DOLRT, Growth, Highway, Infrastructure, Light Rail, LRT, Population, ppsm, Roadway, study on August 28, 2015 by admin. Articles from local newspapers in the Triangle area. Articles on other related topics. This entry was posted in Uncategorized and tagged Articles, Chapel Hill, Charlotte, Congestion, Daily Boardings, DOLRT, Duke, Durham, GoTriangle, Light Rail, LRT, Lynx, NC on August 28, 2015 by admin. As Charlotte’s LYNX approaches a decade of service (started in Nov 2007), let’s look more closely at this heralded ‘success’. By reviewing the NTD federal filings, (Charlotte LYNX ridership data is on tab UPT (Unlinked Passenger Trips), row 663, column CB). 13,362 average daily ridership (workdays and weekend) during Oct 2016 (serving less than 6680 people daily, or less than 1% of Charlotte’s population of 827,000). 13,332 average daily ridership over last 9 years with a flat trend line (despite 20% population growth between 2007 and 2015). 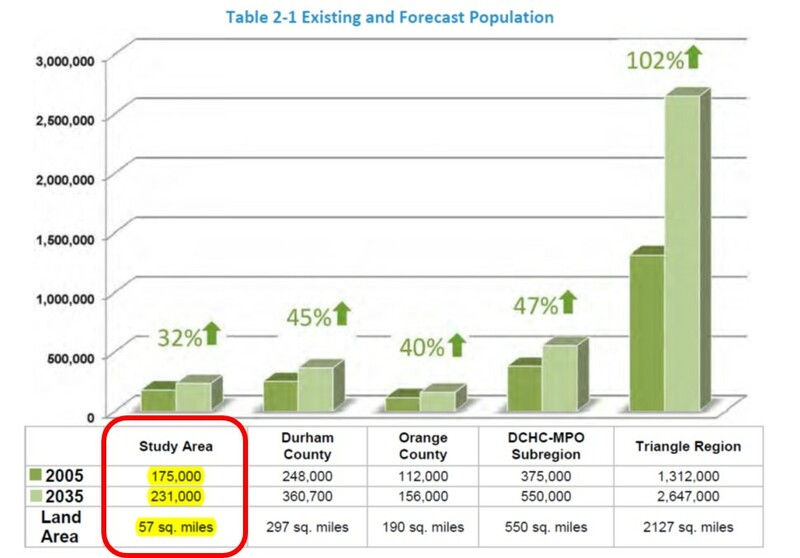 During this same period Charlotte’s population grew 20% (691K in 2007 to 827K in 2015 per US Census), with increasing traffic congestion (Study: Charlotte roads, traffic among worst in North Carolina). It would appear that the only thing that hasn’t grown over the past decade is Charlotte’s LYNX daily ridership. In fact, relative to Charlotte’s ever growing population, LYNX relative riderships (as a percentage of population served) has declined over the past decade. How did Charlotte get there? Citizens attempted to repeal the sales transit tax, but were ultimately defeated after citizen’s campaign was outspent 50:1 by corporate vested interests (like Duke Energy, Wachovia now Wells Fargo, Bank of America, McDonald Transit Associates, Parsons Brinckerhoff, and Siemens). An additional twenty major businesses contributed, all of whom profit from CATS operations according to former city council member Don Reid. The Charlotte Lynx daily ridership has stagnated 16,000 workday boardings over the last 7 years while the area’s population grew 17%, having no net effect on reducing traffic congestion. 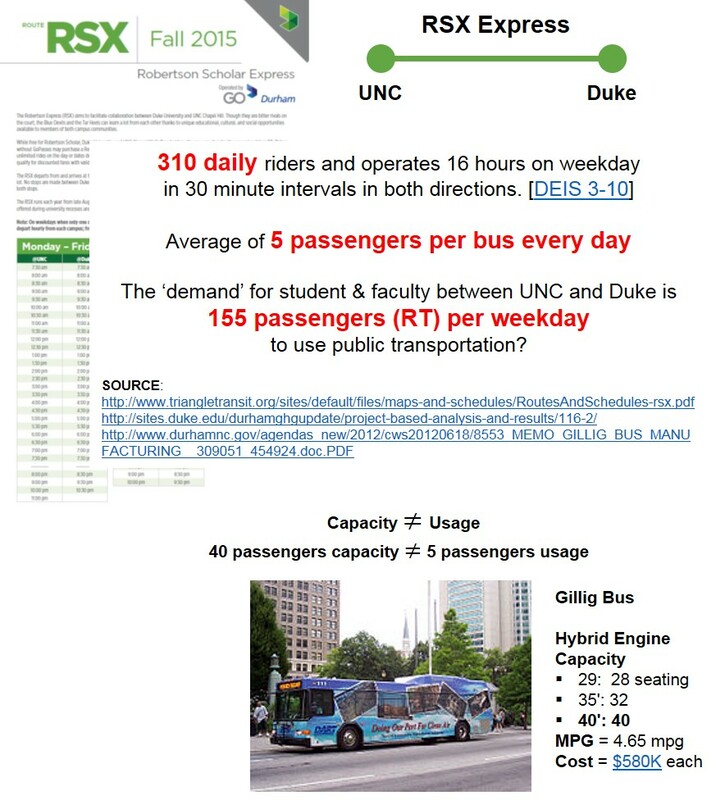 Even accounting for ‘choice riders’ those who would give up their cars in favor of Charlotte LYNX, the changes in gasoline prices has had no effect on daily ridership. Despite the high costs and low ridership, CATS wants more rail — but doesn’t have any money to pay for it. So it has rolled out a campaign of declaring the light rail a great success, especially in the field of economic development. Of course, in most cases it was the subsidies, not the rail, that stimulated the development, and most likely the development would have taken place somewhere in the region anyway, though perhaps not in that corridor. “Future expansion includes plans for light rail, streetcars and bus rapid transit along the corridors in the 2030 Transit Corridor System Plan adopted in 2006 by Metropolitan Transit Commission (MTC). Although build-out of the entire system has been estimated for completion by 2034, by 2013, the Charlotte Area Transit System stated it would likely be unable to fund future transit projects apart from the Blue Line Extension, scheduled to begin construction in early 2014. Can some of the Charlotte Area’s Transit System’s ridership woes be blamed on the growing popularity of ride-hailing services like Uber? That’s a question posed in a report from The Charlotte Observer, which notes that in South End — where the nearby light-rail line has been seen as a selling point to attract new residents — many people are choosing the app-based services over public transit. For much of the past year, ridership on Charlotte Area Transit System buses and the Lynx Blue Line has declined. For the first nine months of the fiscal year, ridership on all CATS services, including buses and the light rail, was down 4.3 percent compared with the same period a year earlier. Over the past seven years, ridership at the four Lynx stations in the South End has increased from 1,595 average weekday boardings in March 2009 to 2,057 boardings in March 2016. That’s a 30% increase in seven years. But during the same period, the number of residents has increased at a much faster rate, from 3,400 to 8,000 people (+135%). Kaitlin Flanagan, who works in SouthPark, says she sometimes takes the train uptown, but she almost always uses Uber to get home. “I prefer Uber, especially if there is a big event going on,” she said. Deanna Bencic, who works in south Charlotte, doesn’t take the train to work. And if she’s going out with friends, she doesn’t take the train – even when it’s an option. “If it’s four or five people, then we always use Uber,” she said. In addition, Carlee and his staff, along with the mayor and City Council, have been grappling with unanticipated shortfalls in tax revenue as well as a proposed change in sales-tax sharing that, according to state and city projections, could cost Charlotte an estimated $3 million to $30 million annually. CityLYNX Gold Line facing City budget cuts! half the cost of constructing Phase 2 of the City LYNX Gold Line is being threatened. they already approved for the Gold Line be cut from the budget. However meritorious the DOLRT may be, we need to think seriously about where the money is going to come from to build and operate it, and we need to have a backup transit plan in the event the money for DOLRT doesn’t materialize. This entry was posted in Uncategorized and tagged Charlotte, Congestion, Cuts, Daily Boardings, DEIS, FEIS, Growth, Highway, Infrastructure, Myth, Taxes on August 28, 2015 by admin. Unfortunately, the often promised traffic congestion relief has not been experienced by communities that implement LRT. You can look at two local examples (Charlotte & Los Angeles) or even in aggregate across the nation. Charlotte LYNX daily ridership has stagnated at 16,000 over last 7 years, while the population grew 20%. Despite all this investment in LYNX, Charlotte was rated as the having the worse traffic in NC. In North Carolina, Eric Lamb, Manager of the City of Raleigh Office of Transportation, is not so sure about the correlation between transit and congestion abatement. He cites South Boulevard in Charlotte which directly parallels that city’s Lynx Blue Line light rail system. Despite the light rail line … there has been no corresponding reduction in traffic volumes along South Boulevard. David Hartgen, emeritus professor of transportation studies at UNC Charlotte has authored a study concluding that the Triangle project would not reduce vehicle congestion or travel time, the very benefits supporters tout in seeking the outlay needed to fund the project. So what happens if we don’t build the light rail project? The mean travel time to work according to the 2014 US Census is 21.5 minutes (Durham County) and 22.0 minutes (Orange County). So what happens to travel times if we do not implement the DOLRT project? 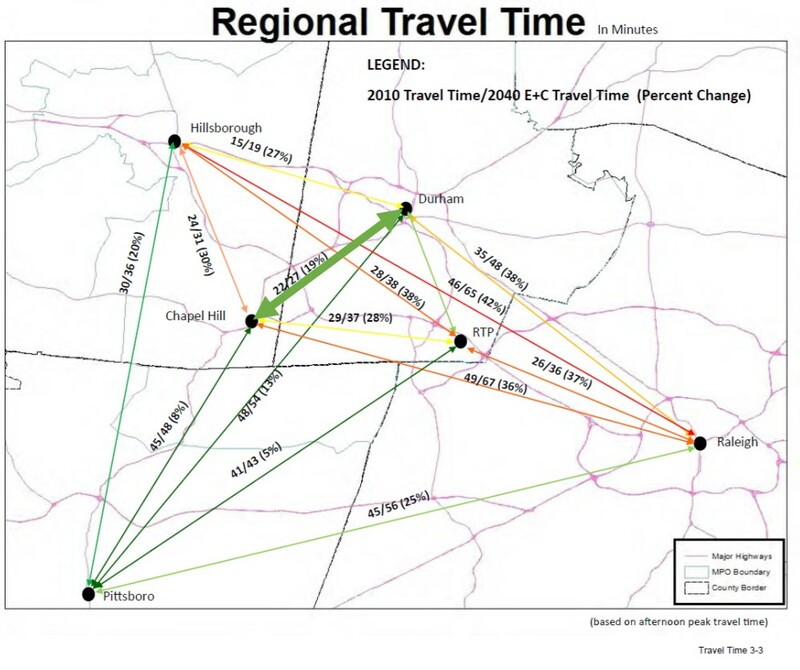 According to the DCHC MPO Alternatives Analysis, 2040 travel times using Existing+Committed is projected to be 27 minutes. Yet the proposed DOLRT will take 46 minutes (+10 minutes at terminus) . Now include the waiting time for the next train, the time to get to/from the station (via Park&Ride, Kiss&Ride, bicycle, walking, or bus transfer), it will even be LONGER. So how is this faster than the automobile that it is supposed to replace? But it’s still more efficient than other alternatives? The latest revised DOLRT optimistically projects 27,000 daily boardings (with NCCU extension in 2040) during 18.5 hours of daily operation across the 17.7-mile circuit (at a cost of $2.5 BILLION or $141 million per mile) to serve an average 730 passengers per hour (on each track). While advocates will argue that LRT has higher ‘capacity’, it will not necessarily mean that it has higher ‘usage.’ We should not confuse capacity with usage. So how does that compare to the much hated highway? Well, not so well. A typical highways can accommodate 2,200 vehicles per lane per hour (human driven), utilizing about 5% of roadway capacity. And you can place 4 lanes within the same 50′ right-of-way required for DOLRT. And as autonomous vehicles become pervasive, this capacity will increase significantly, as the vehicles will be able to drive in much closer proximity thereby dramatically increasing the capacity of our existing roadway infrastructure. By using BRT, we will be able to organically add to this capacity; whereas with LRT relying on a roadway of steel rails, we will not, as it will be dedicated solely for the train and we will not be able to share with other autonomous vehicles. This entry was posted in myth and tagged 2040, APTA, Autonomous Vehicles, BRT, Capacity, Chapel Hill, Charlotte, Commute, Congestion, Daily Boardings, DOLRT, Durham, Highway, Infrastructure, LRT, Lynx, NC, Orange, Raleigh, Right of Way, Roadway, ROW, Traffic, US Census, Vehicles on August 28, 2015 by admin.